Russian Prime Minister Vladimir Putin evaded almost all questions concerning politics while talking to reporters in Bratislava where Russia won the right to stage the 2016 world championship in hockey. 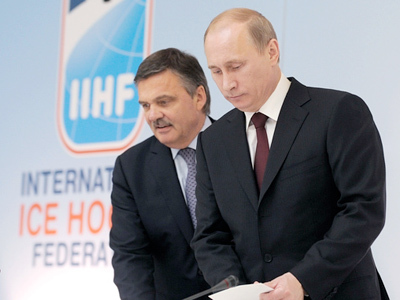 Putin was making an official visit to Slovakia on Friday and the fact that the announcement on the 2016 World Hockey Championship was made on the same day is hardly a coincidence. The event was anticipated in the hockey community and Russia’s main rivals Denmark and Ukraine voluntary withdrew from the competition. Putin dedicated a special news conference to the event at which he even addressed the audience in English, which he does only rarely. Reporters tried to switch the discussion into the political field, but had little success. Putin said that the main topic of the conference was sports and refused to answer the politics-related questions. He only made a small comment on the situation in Libya saying that a compromise would be the best solution in the current crisis. "The very best approach to resolving the Libyan problem is if the conflicting sides start seeking compromise in the interests of their people," the Russian prime minister said. Putin strongly refused to answer the question about his future political plans even though it was made in a disguised form “in what role are you planning to watch the 2016 World Championship in Russia?” “I have made too many statements on this subject and Dmitry Anatolyevich [Medvedev] made them as well, I simply have nothing to add,” Putin said.